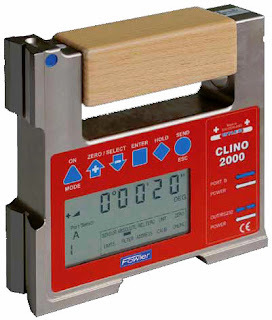 Fowler/WYLER's digital inclination measuring instrument……the Clino 2000…combines precision and quality for a great variety of measuring tasks that will fulfill all your requirements. Highest possible precision over large measuring range of ±45° with integrated temperature compensation. Effortless zero adjustment by using the integrated software and a reversal measurement. Easy to calibrate due to implemented software guidance and the calibration aids included. Built-in possibility to connect an additional instrument for differential measurement or Zerotronic sensors by using the serial I/O port. Large digital display for setting all commonly used measuring units. The instrument is fully compatible with the whole range of digital sensors from WYLER. Powered by common 1.5 V batteries, rechargeable batteries or with mains adaptor. Fulfills the strict European CE requirements (immunity against electromagnetic smog). Rugged stainless steel housing with ground prismatic bases allows use on flat or cylindrical surfaces. Limits of error: <12 Sec. of arc + 0.027% readout or <30 Sec. of arc. After using quick calibration aids. Temperature range: Operating: 0?‹ to 40?‹C. Storage: -20?‹ to 70?‹C.